For the first time in a decade, economies throughout the world are experiencing a synchronized economic expansion, meaning that all of the world's major economies, whether developed like France or developing like Brazil, are expanding simultaneously. Driven primarily by consumer spending, the U.S. economy entered its ninth year of recovery several months ago. We are in the midst of the third longest expansion in American history. At 4.1 percent, the official rate of unemployment is at a 17-year low at the time of this writing. Not coincidentally, consumer confidence is at a 17-year high, with surging stock and housing prices boosting aggregate U.S. household wealth to unprecedented heights. As a wealthy state, Maryland benefits disproportionately from positive wealth effects. That helps explain the state's extraordinary pace of job creation. 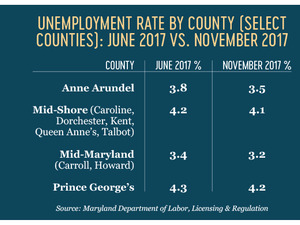 Maryland's unemployment rate is at its lowest point since before the Great Recession when the housing market was still skyrocketing. With unemployment so low, one would expect that inflation would have become far more apparent. This hasn't been the case. Based on the measure commonly used by the U.S. Federal Reserve (the core Personal Consumption Expenditures deflator), it appears that the aggregate price level is up by less than two percent over the last 12 months (well below in fact—1.3 percent). This is in spite of healthcare providers, construction firms, trucking enterprises, and manufacturers reporting difficulty finding qualified people to hire, health insurance premiums surging, rents rising, tuitions reaching new heights, and construction material costs spiking (e.g. softwood lumber, up 15 percent during a recent 12-month period). One implication arising from the dearth of inflation evident in the data is that the Federal Reserve has managed to refrain from aggressive monetary tightening. For the most part, interest rates have remained extraordinarily low, including mortgage rates. That has fueled additional leveraging of balance sheets and supported higher equity prices. It has also induced more consumers to take on additional debt. In September 2017, American consumers collectively increased their borrowing by nearly $21 billion dollars. That represented the largest gain in ten months and was led by sharp increases in borrowing for student and auto loans. The category that includes credit card debt experienced an increase in consumer borrowing exceeding $6 billion dollars in September. As indicated by the Associated Press, by the end of September, total household borrowing stood at a new record of approximately $3.8 trillion dollars. Importantly, the Federal Reserve data do not encompass home mortgages or other loans such as home equity loans that are secured by real estate. There's more. 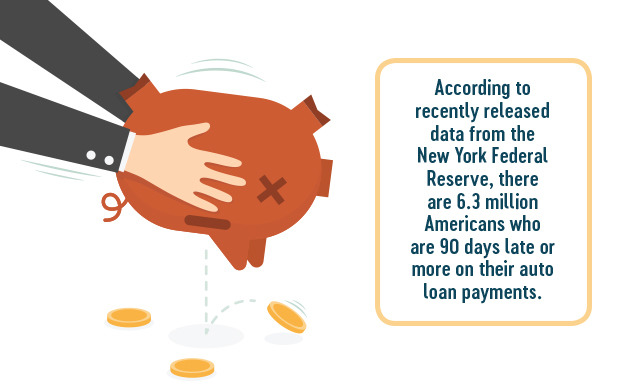 According to recently released data from the New York Federal Reserve, there are 6.3 million Americans who are 90 days late or more on their auto loan payments. That's up by about 400,000 from a year ago. As indicated by the Washington Post, the delinquency rate on auto loans has been rising steadily since 2011. That’s remarkable given all the progress that we have observed in the labor market since that time. In recent years, credit has been extended to many with poor credit scores. Many of the people who can’t pay their auto loans have credit scores below 620 on an 800-point scale. Many of these people have few options to obtain money to purchase a new or used car and often end up with a subprime auto loans that can come with an interest rate of 15 to 20 percent. Here's the issue. While consumer borrowing helps support economic activity today, it may jeopardize economic performance at some point in the future. In the absence of savings, households have to pull back their economic activity sharply in the event of negative outcomes, whether related to employment, health, etc. Moreover, with more people falling behind on their repayments, financiers will gradually reduce the availability of credit, eventually slowing the economy. That hasn't happened yet, but the specter of tightening credit in 2018 is very real. Over the past year, Maryland’s economic performance has been rather impressive. 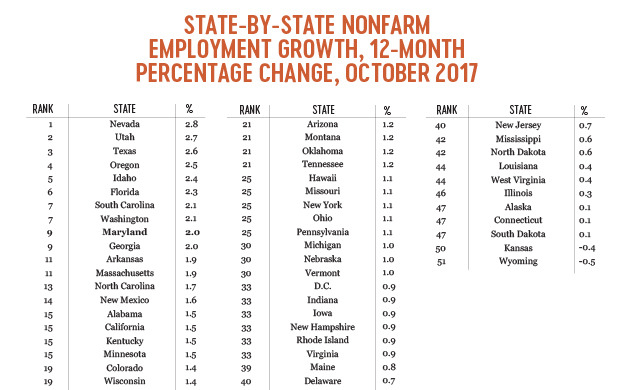 Between October 2016 and October 2017, the state ranked ninth nationally in terms of percentage job growth among the 50 U.S. states and District of Columbia, behind perennial heavy hitters like Texas and Florida. The state added more than 54,000 jobs during this 12-month period. Maryland's performance is explained by a confluence of factors. 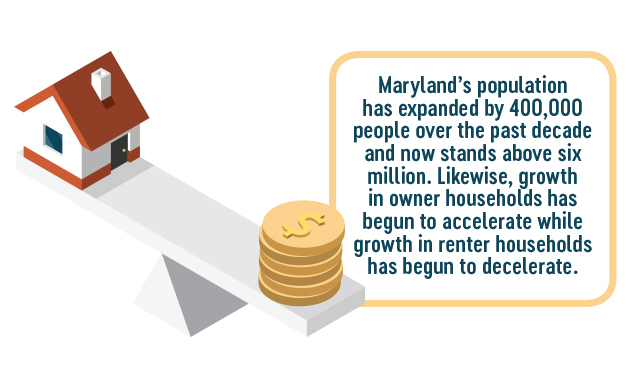 Maryland is a wealthy state and as such benefits disproportionately when financial asset prices and real estate values rise. Despite the clamor coming from Washington, D.C. regarding smaller government, federal spending patterns have yet to change significantly and deficit spending continues. As a state with a high number of government agencies and contractors, this steady stream of government spending represents a boon for the economy, including for firms specializing in cyber and homeland security. There are also a number of large-scale developable sites in the state, such as Tradepoint Atlantic, National Harbor, College Park's Discovery District, Konterra (Laurel), downtown Columbia, downtown Towson, White Oak in Montgomery County, and Port Covington in Baltimore. These sites are attracting large-scale investment and more jobs. The inflow of educated millennials to the Baltimore-Washington corridor also represents a major factor. Indeed, many of the nation's best performing markets are associated with significant appeal to millennials, including Seattle, Portland, San Jose, Dallas, Austin, Boston, Nashville, and Atlanta. Importantly, the strength of Maryland’s economy is no longer relegated to the Baltimore-Washington corridor. During the early stages of the recovery, it was counties like Montgomery, Howard, and Anne Arundel that began to recover fastest as the banking sector stabilized and financial markets began to produce wealth. Baltimore City and Prince George’s County began to recover thereafter as their housing market s belatedly stabilized. However, even several years into the national economic recovery, the Eastern Shore and other rural areas continued to experience stagnant conditions, including in beleaguered housing markets associated with an abundance of homes available for sale. That has changed. Housing markets throughout Maryland have been on the rebound in recent years. Available inventory has plummeted due to a combination of strengthening job growth, a rebounding market for second homes, and stubbornly low mortgage rates. One of the more inspiring stories pertains to Salisbury, the commercial hub of Maryland’s Eastern Shore. Since 2010, Salisbury has added more than 3,000 residents. A combination of job growth from service providers, distributors, and manufacturers has helped. By October 2017, unemployment in the Salisbury metropolitan area has slipped below 5 percent, with the region adding 3,300 jobs during a recent 12-month period. One possible source of economic momentum has been the repeal of impact fees in Wicomico County. In 2016, the County voted to repeal fees on new construction to bolster the housing industry, which has been lackluster for nearly a decade. Perhaps not coincidentally, these impact fees were legislated in 2006, requiring developers to pay $5,231 for the construction of a single-family home and $1,524 for each unit in a multi-family dwelling. A USA Today article indicates that repeal has already produced impact, with Gladden Construction eaking ground on a new single-family development within the city, the first in the past ten years. This is not to suggest that impact fees are always deleterious. However, in the instance of Salisbury, their removal appears to have been a source of much-needed residential development momentum. The statewide housing market has been bolstered by a number of factors, and not simply low interest rates, rising stock prices, and rapid job growth. The state’s population continues to expand. Maryland’s population has expanded by 400,000 people over the past decade and now stands above six million. Likewise, growth in owner households has begun to accelerate while growth in renter households has begun to decelerate. This is consistent with mounting evidence that first-time homebuyers represent a growing force within national and local housing markets. Given all these positive factors, one might wonder how it could possibly be that home sales statewide were up only 2.5 percent in October on a year-over-year basis. The answer remains unaltered from prior months—a dearth of inventory that continues to frustrate transactional activity. Incredibly, though inventory remains low, single-family homebuilding in much of Maryland remains suppressed, with Anne Arundel County representing a prominent exception. The active inventory of unsold homes in Maryland declined from 26,055 (October 2016) to 23,301 (October 2017), based on information released by the Maryland Association of Realtors. The result is that the months of inventory measure has declined from four months a year ago to 3.5 months more recently. In Prince George's County, inventory is down to just 2.3 months. That county has remained a leader in statewide job growth in recent months and the appetite to live there has been rising. Impending investment in new medical facilities, and the emergence of National Harbor, College Park, Hyattsville, and other communities have each represented key factors supporting the county's rapid economic expansion. In neighboring Montgomery County, inventory stood at 2.6 months in October. Howard County's inventory is currently at 3.3 months. This pattern of declining housing inventory has become increasingly apparent in rural areas. In Somerset County, months of inventory declined from 16.3 months to 10.1 months over a recent 12-month period. Similar dynamics are apparent in Washington County, where the active inventory slid from 5.7 months to four months. The inventory of unsold homes is also lower in Allegany, Caroline, Dorchester, Garrett, Kent, Queen Anne's, Talbot, and Worcester Counties. for a weaker 2019 and/or 2020. It is certainly conceivable, perhaps even likely, that the next economic downturn will begin during this two-year period or shortly thereafter. 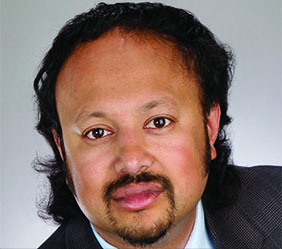 Anirban Basu is Chairman & CEO of Sage Policy Group, an economic and policy consulting firm in Baltimore, Maryland that he founded in 2004. Mr. Basu is among the most recognizable economists, in part because of his consulting work on behalf of numerous clients, including prominent developers, bankers, okerage houses, energy suppliers, law firms, and business associations.